5 out of 5 stars - Apple Watch - Series 3 - Brand New - 38MM - GPS-WiFi Bluetooth-1 Year Warranty! 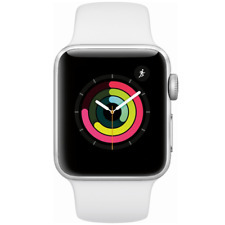 64 product ratings64 product ratings - Apple Watch - Series 3 - Brand New - 38MM - GPS-WiFi Bluetooth-1 Year Warranty! Its internal speaker uses its own vibrations to force water out once it's clear of the waves. Apple Watch displays alerts from your iPhone so you can respond or dismiss them at will. Customize the face of your Apple Watch to fit your needs, from chronographs to digital faces to a model of the solar system. Trending at $259.20eBay determines this price through a machine learned model of the product's sale prices within the last 90 days. 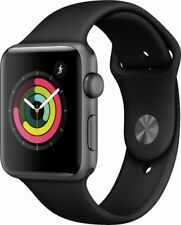 (Series 3 Apple Watch Sport 42mm Space Gray Aluminum Black Sport Band LTE Cellular. OS:Apple Watch OS. Band will have signs of previous use!). OEM Box is NOT included! Model Number:MR2X2LL/A / MTGT2LL/A / MTF32LL/A / MQK22LL/A. Generation 3 Series 3 38mm Space Gray / Black Band Item is New and has never been used. It is absolute perfect condition. Item is new, however box may or may not be included. Whats Included: Apple Watch Series 3 Space Gray Aluminum Case Black Large & Small Bands Apple Charging Cable. 3rd Party Olive Nylon Loop. ➤ Up to 18 hours of battery life. 8/10 Condition. Visible scratches on the screen. Fully functional. iCloud unlocked. Its internal speaker uses its own vibrations to force water out once it's clear of the waves. Apple Watch displays alerts from your iPhone so you can respond or dismiss them at will. The Activity app displays progress made towards your daily activity goals with three intuitive rings that grow the more you move, finally closing when you hit your targets. Trending at $273.50eBay determines this price through a machine learned model of the product's sale prices within the last 90 days. 3rd Party Obsidian Nylon Loop. Activity and Heart Rate Monitoring Changeable Faces with Widgets. Bluetooth 4.0, 802.11b/g/n Wi-Fi Apple watchOS 4. Aluminum Chassis with Ion-X Glass 1.3" 272 x 340 Display. Apple Watch Series 3 42mm Silver Aluminum Case White Sport Band GPS- (MTF22LL/A). I received this a gift for Christmas, 2018, but have decided to switch to the cellular version. It’s in like new condition and well taken care of. Please feel free to send me any questions you may have. Shipped with USPS Priority Mail. 3rd Party Olive Nylon Loop. ➤ Up to 18 hours of battery life. 9/10 Condition. Light scratches on the screen. Fully functional. 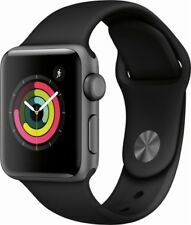 NEW Apple Watch Series 3 (GPS) 42mm Space Gray Aluminum Case W/ Black Sport Band. Condition is New. Shipped with USPS Priority Mail. Factory sealed and free same day shipping with insurance!! 100% positive feedback seller!! Serial numbers may vary. Trending at $224.97eBay determines this price through a machine learned model of the product's sale prices within the last 90 days. Activity and Heart Rate Monitoring Changeable Faces with Widgets. 3rd Party Black Nylon Loop. Bluetooth 4.0, 802.11b/g/n Wi-Fi Apple watchOS. Aluminum Chassis with Ion-X Glass 1.3" 272 x 340 Display. Trending at $11.35eBay determines this price through a machine learned model of the product's sale prices within the last 90 days. Low and high heart rate notifications. New Breathe watch faces. Automatic workout detection. New yoga and hiking workouts. Advanced features for runners like cadence and pace alerts. New head-to-head competitions. Apple warranty my have already started and might not be for a full year. Apple warranty included.